The American Medical Association claims that there is a nightmare going on in the emergency rooms of the hospitals throughout our country. 78% of the people arriving at the emergency don’t have their HIPAA or AHCD with them. Doctors are reluctant to make any decisions without both a current HIPAA and health care directive because the doctors could be fined for up to $250,000 or even lose their license. We all know how important it is to have our emergency information with us in case of an accident or other emergency. Who should be contacted? Who is your physician? Do you have any permanent medical conditions? What are the medications you are taking? Who makes medical decisions on your behalf if you are unable to? We will provide you with a personalized wallet card. This card features important medical information such as allergies, medical conditions, your emergency contacts, and your personal doctor. The wallet card instructs the hospital to contact them by telephone or via computer to receive your health care directives immediately – anytime, any day, anywhere in the world. The hospital receives all of your stored health care directives, medical information, telephone numbers of three emergency contacts, and information on your primary physician. 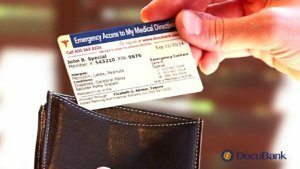 Your wallet card quickly puts your health care directives in the hands of the doctors and caregivers who need them when it is needed the most. The medical staff can provide care according to your wishes. They can also contact loved ones easily. You carry the card in your wallet next to your driver’s license so it can be found quickly in an emergency. The Law Offices of W. Bailey Smith will provide this extra service free of charge for one (1) year to all of our clients for their peace of mind. After one (1) year, then the Client may continue this service for a nominal fee.